I am trying a loose version of a monochromatic card for Father's Day. I hope others will like it as much as I do. It has always been a challenge to create masculine cards for most folks. Step 1: Stamp the Ship in Bottle image in black ink on white card stock. Step 2: Emboss the sentiment on a blue banner in white. 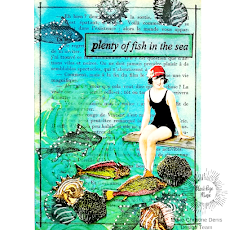 Step 3: Using the Rule of Thirds, stamp the fish background stamp over 2/3's of the card layer using embossing ink. Stamp anchor from Sin City Nautical 2 set and emboss in white on the other third of the card layer. Step 4: Cut out Ship in Bottle and ink blend teal over entire image. Using the silver marker color the bottle cap in. Step 5: Assemble card by using pop ups to give the bottle and multi-layered sentiment dimension. A Father's Day card couldn't be any simpler. I know any Dad would love to get this card on his special day. Please share your Father's Day creations with the Sin City Stamps Fan Page! Just SUPER FINE Adam. What a great background with the fish but so perfect that you didn't go all the way across - the anchor is an AWESOME choice. Really FAB card! Xj.